Trentino DOC Pinot Grigio. Produce of Italy. From grapes grown on the hills of Trentino, in northern Italy, where altitude and extra time on the vine bring enhanced complexity and provide dry, delicate flavours of red apple, ripe pears and honey blossom. This white couples perfectly with grilled fish or a crisp salad. Store in cool, dark place. The winemaking method for white wine is used and the must is obtained by soft pressing in order to prevent the natural copper colour being extracted from the skins. Fermentation is carried out with the use of selected yeasts and at controlled temperature (18 °C). It is subsequently finished in stainless steel tanks followed by stabilisation and sterile cold bottling. 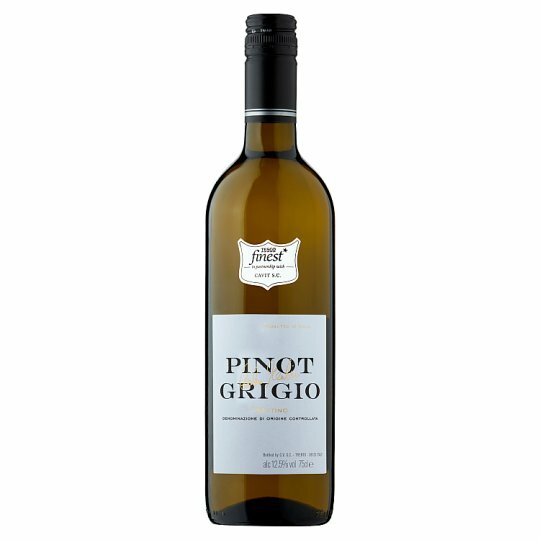 Pinot Grigio variety was introduced into Trentino by the Agricultural Institute of San Michele all'Adige at the beginning of the 20th century, in order to increase the presence of several grape varieties on this side of the Alps. This variety has been naturalized so successfully in Trentino region, that it has become the “ambassador of Trentino” worldwide. Production area: Trentino region, in specific from the Roverè della Luna alluvial fan and along the whole stretch of the Adige river, as far as the Vallagarina and Valle dei Laghi valleys. Store in a cool, dark place. To enjoy this wine at its best, drink within a year of purchase. Once open, drink within 2 days.